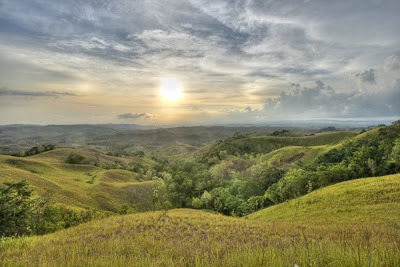 The rolling hills of Central Sumba at sunset. 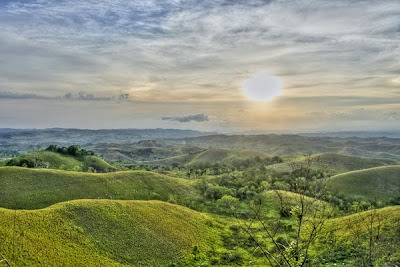 The rolling hills of Central Sumba at sunset. Sumba Timur, Nusa Tenggara Timur, Indonesia. 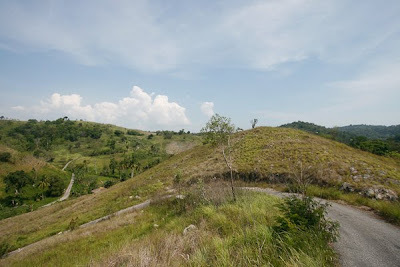 The road from Tarimbang to the main "Trans-Sumba Highway". Sumba Timur, Nusa Tenggara Timur, Indonesia. This will soon be a nice asphalt road through a beautiful landscape of rolling hills. It's the road from Tarimbang to the main "Trans-Sumba Highway". Sumba Timur, Nusa Tenggara Timur, Indonesia. 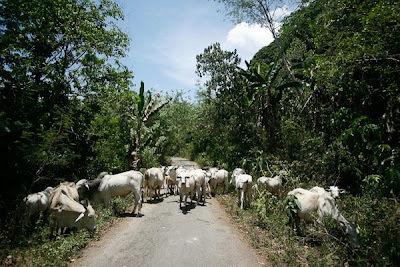 Cows on the road 14 kms north of Terimbang, Sumba, Indonesia. 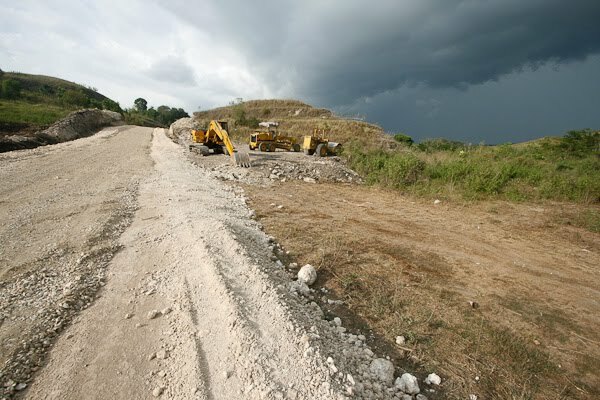 A tree has been cut to clear the main coastal road in south-eastern Sumba. The nature is varied. Here the road climbs from sea level to 600 meters in just a few kilometers. The rainforest is very dense and it has the strongest protection; It's a national park. 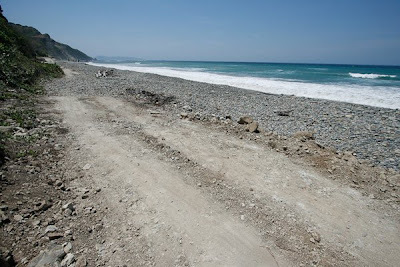 The road is laterally on the beach just before Tawui on the southern coast of Sumba. 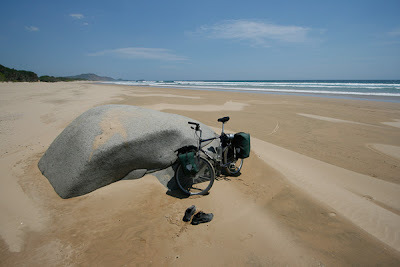 Around Tawui it's possible to cycle on the beach, and go for a swim if it gets too hot. 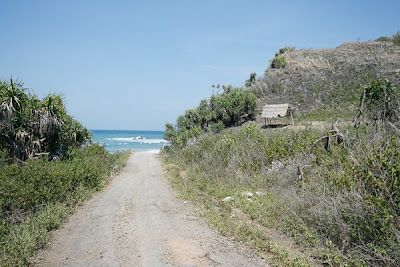 Roads of Sumba: To the beach! 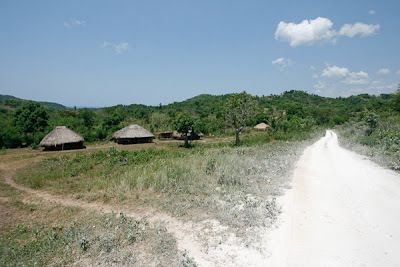 The main coastal road in south-eastern Sumba follows the beach just before the village of Tawui. Bridges are rare in south-eastern Sumba (but a few are being built). The roads just crosses the river beds. 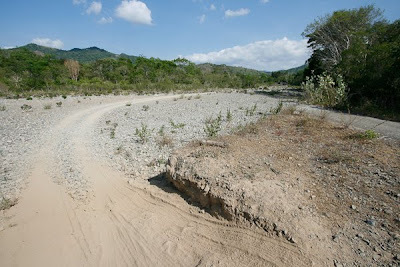 Some of these rivers may be difficult to cross in the rainy season. 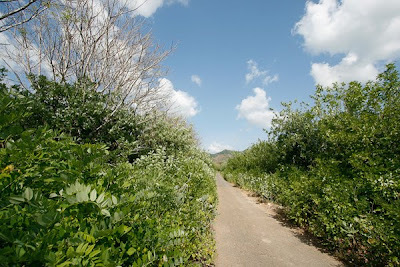 The main coastal road between Ngonggi and Tawui is sometimes paved and flat. I thought the mountain roads of West Timor were the worst and steepest. I was wrong. 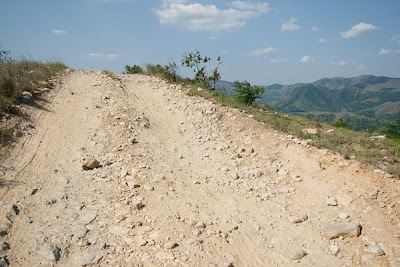 Sumba now holds the record for crazy steep roads in bad condition. 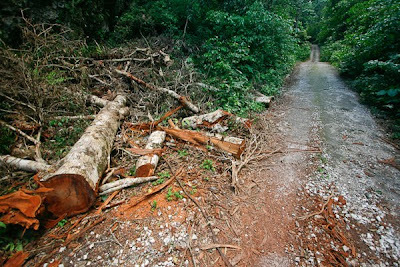 Only motorcycles, trucks, some 4x4 with large wheels, and mountainbikes can make it through here. 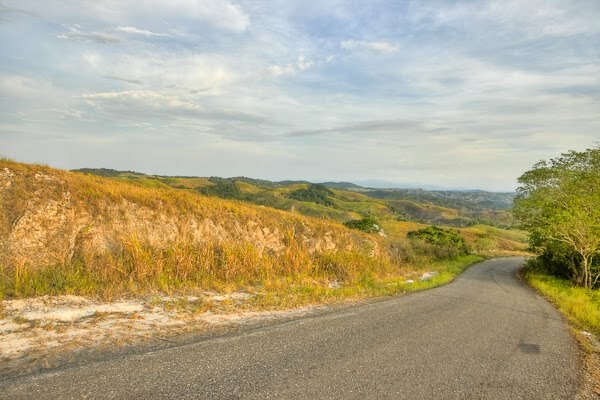 The road on the photo follows a ridge to the north before dropping into the valley and making a 180 degree turn to the south, toward Ngonggi and the coast. The steeper sections (not on the photo) are often paved, but still too steep to cycle sometimes. I approximate the steepest road sections to 20+ percent (One meter up in every five meters forward). A black diamond ski slope is 25 percent and up. One of the most remote roads of south-eastern Sumba (The road between Baing and Terimbang along the coast) passes very few villages and hamlets. This is one of them.